Libraries come in all shapes and sizes and I’m a firm believer that the architecture sends out a clear message of intent, at least with regards to how we value knowledge. The Vancouver Public Library resembles the Amphitheatrum Flavium in Rome whereas the National Library of Latvia in Riga is like a giant swaying Orca fin, cutting through the landscape and towering over the Daugava River. However it is worth noting that when an entire budget is ploughed into a grand building it can come with consequences. The City of Birmingham Library cost 189 million to build and now can’t afford to stock new books! 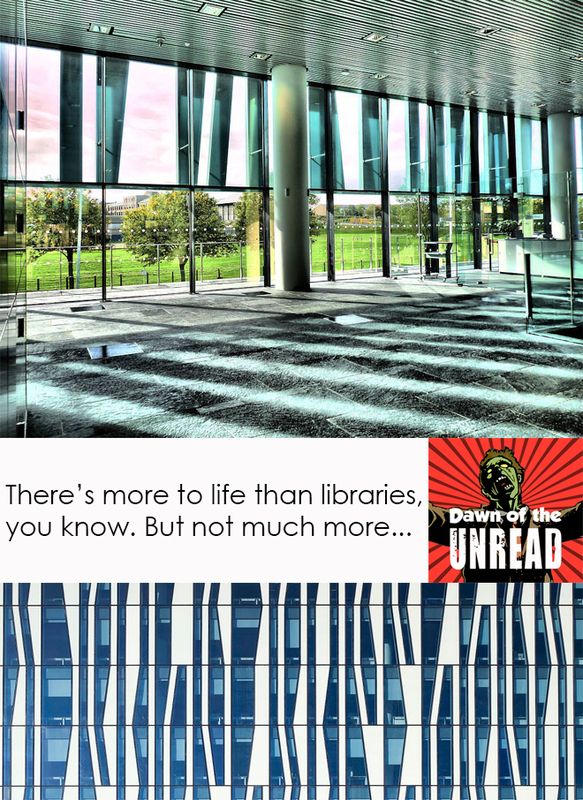 One library I’ve been desperate to see since it opened on 24 September 2012 is the Sir Duncan Rice Library at Aberdeen University. You don’t get more rotund than this large modernist rectangle. It’s like the Gods have been playing Tetris and a block has fallen from the skies and landed in the grounds of this ancient 15th century university. 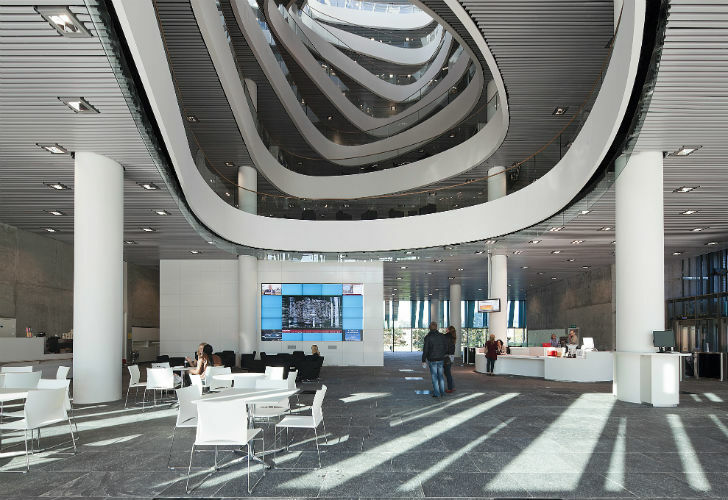 Here’s the vital statistics: It’s comprised of 22,000 tonnes of concrete, 2,200 tonnes of steel, 760 glass panels, 4,700 lights and 24 kilometres of shelving. You can huff and you can puff, but no budgetary cuts will blow this beast down. When I arrived there was some work going on at the entrance and I got chatting to some students. One of them told me that the work had been going on for a long time and this was because the architect had not factored in the weight of books when designing it and so it was sinking. This of course is an urban myth, although I loved the idea of a building collapsing due to the weight of ideas. I spoke to Ewan Grant, one of the library staff at the Sir Duncan Rice Library (TSDRL), which is just one part of what is known as Library, Special Collections and Museums. 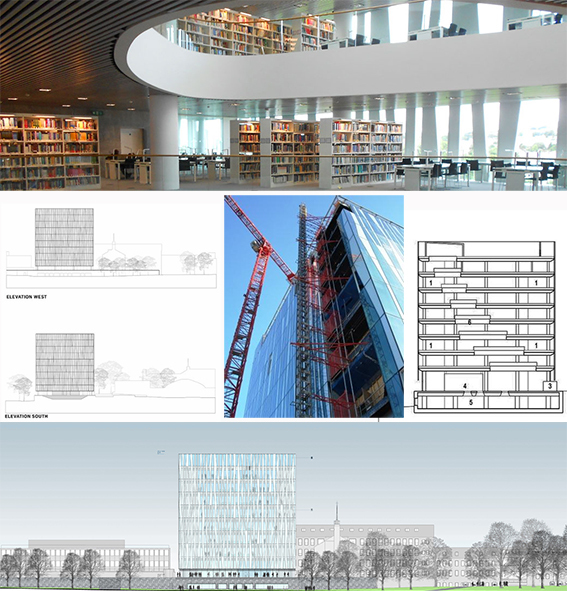 The collections of a modern academic library, however, stretch way beyond the physical materials on the shelves. Therefore they have embraced digital to adapt to the needs of the modern student with over half a million e-books as well as access to thousands of scholarly articles. As a student, many moons ago, I remember reading that the average journal article was read by around 2 people. Digitisation puts an end to that by making niche work accessible. In the public sector many librarians have lost jobs due to government cuts and what can only be deemed a depreciation of the role of the librarian, with some councils advocating ‘voluntary’ helpers as a means of plugging the gap. Although this is unlikely to ever happen to a university, particularly now that students are paying full whack for their education, Ewan and his team are a prescient reminder that librarians are skilled members of staff. Libraries can clearly no longer function as warehouses for books if they are to remain hubs of the community in our digitally driven present and so TSDRL provides a variety of services to keep punters interested. This includes the obligatory café, an events area for school visits and a gallery on the ground floor. The gallery is superb and a simple means of drawing attention to the university’s Special Collections via a programme of exhibitions. During my visit the theme was The Far North: Frozen Stars, Shifting Ice & the Silence Beyond and included Innuit artefacts, diaries from explorers and contemporary art from the likes of Reinhard Behrens, Pat Law and Briony Anderson. The effect was simple: I wanted to go and find books to learn more. 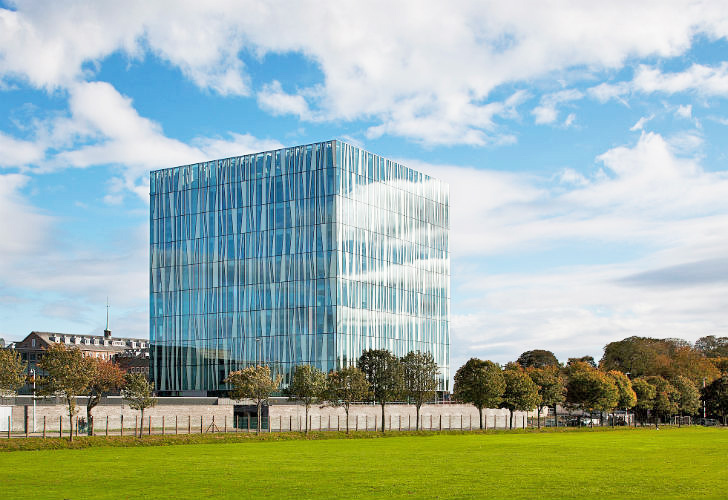 The ice and light of the north was also instrumental in informing the building design by Danish architects Schmidt Hammer Lassen. The exterior of the building has white lines dripping down what appears to be an off blue glass. It’s like the building is melting before your eyes. It has since gone on to win an RIAS and RIBA Award. When you enter the building you’re greeted by a large interactive screen which lists the names of benefactors as well as general information. One thing I was particularly impressed by was a note stating that 3 day loan books would be automatically renewed if they weren’t on order, thereby saving students a lot of money in fines. Other university libraries take note. 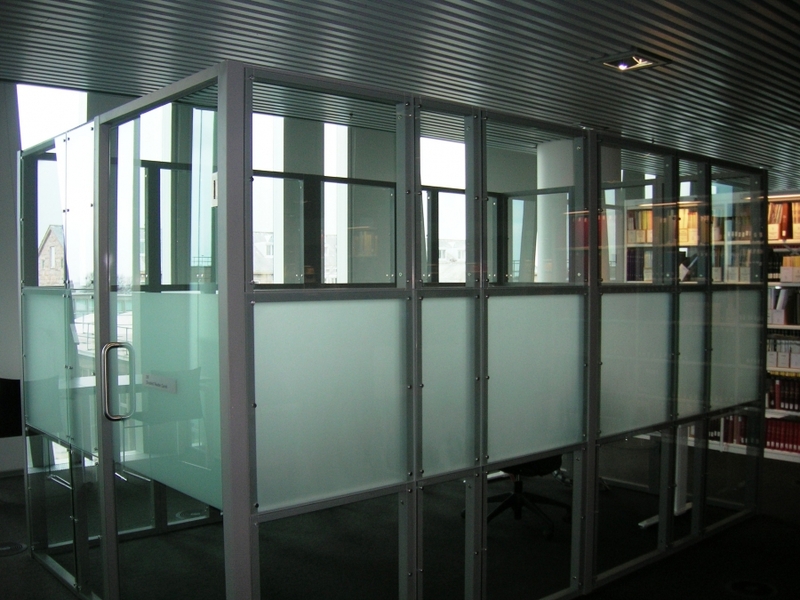 The seven floors of the building are partitioned via swooping contours and decorated in a minimalist white. This enables light to run through the building while also creating different perspectives, depending on whether you are stood at the top looking down or the bottom looking up. “It is a truly beautiful and pleasant building to study and work in” says Ewan. 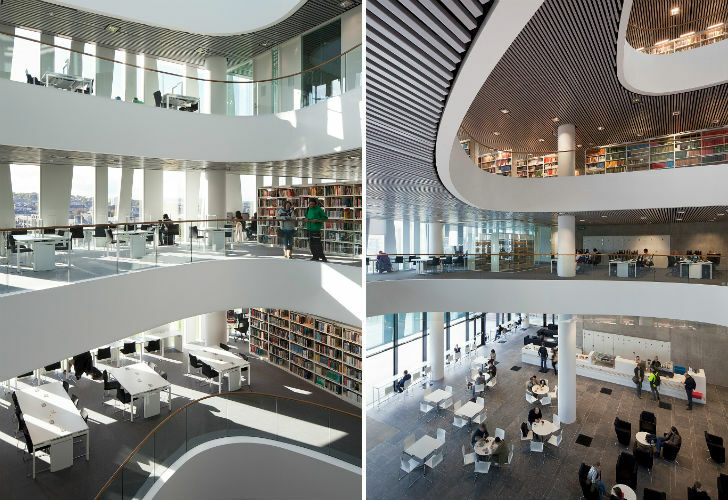 There are many ways in which you can experience the space of a library this vast. But one thing in particular that caught my eye was a kind of reading cell that I presumed you could rent out and use without fear of being distracted. However, Ewan explains that these are Assistive Technology Booths (ATBs) which “are for use by students with disabilities, specific learning difficulties or medical condition and provide a selection of assistive software and hardware that couldn’t practically be provided on the regular Classroom Computers”. Although there are many beautiful things to love about this library I ask Ewan if he has one favourite spot. 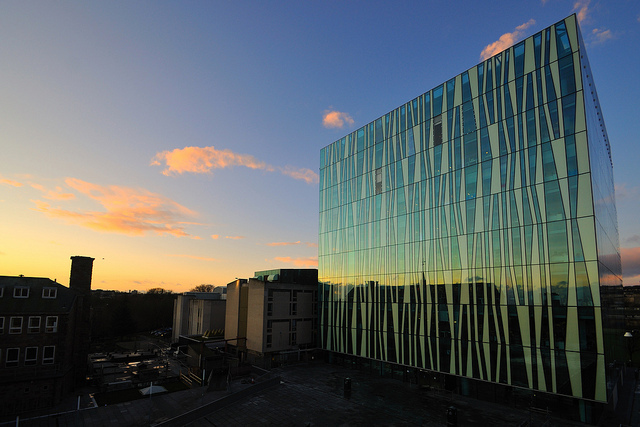 Other than his office with its glorious panoramic views over the North Sea “it has to be the main open space out on the library floors, and especially during sunsets over winter, late in the afternoon at Aberdeen’s latitude, as the whole inside of the building, the books and the visitors are bathed in the orange light of the setting sun. It really is a bit special. I am often reminded while working in this library just how much of a privilege it is to work here”.